I've discovered that I really like scones. To be honest, I've never really had one until a couple of months ago because I always thought they would be really dry and stale, or at least they looked to be that way. My first scone was from my fellow foodie friend of So, How's It Taste?. It was a blueberry scone with a lemony glaze and it was really, really good. It wasn't dry or bland like I thought it would be. After that first bite, I immediately jumped on the scone bandwagon. These pumpkin scones are the second batch of scones I've ever made. 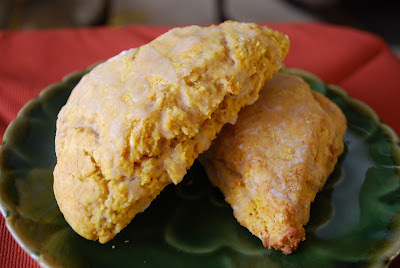 My first batch was with dried cranberries and while I think they would have been better with fresh ones, they would make a great Thanksgiving breakfast treat, just like these pumpkin scones. 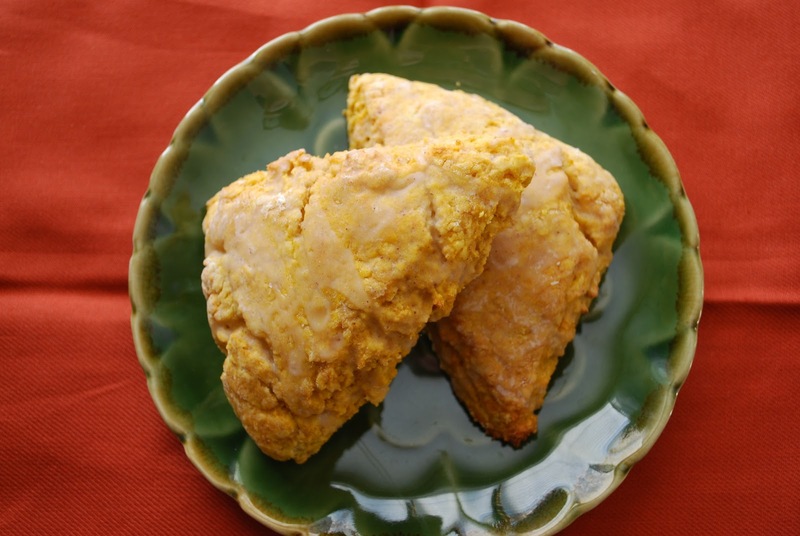 These scones would also be perfect to take with you to snack on while you stand in line at 3AM during Black Friday sales! Preheat the oven to 425 degrees F. Line a baking sheet with parchment paper; set aside. Combine flour, sugar, baking powder, salt, cinnamon, nutmeg, cloves and ginger in a large bowl. Use a fork to cut the butter into the dry ingredients until mixture is crumbly and no chunks of butter are obvious; set aside. Place on prepared baking sheet. Bake for 14-16 minutes, or until light brown. Place on wire rack to cool. *I only got 8 pieces out of my ball of scone dough. I didn't want to pat out the dough too thin because I wanted my scones to be nice and thick. To make the powdered sugar glaze, mix the powdered sugar, milk, and cinnamon together until smooth. When scones are cool, drizzle glaze over the top of each scone. These were great! I hoarded mine for two days because I didn't want it to be gone! I paired mine with a cup of coffee and it was heaven. Must make these again soon! I have to make these scones! I have been dying over them for about a year now but I keep putting it off. bookmarking! Hi Guys! once more I'm present with the latest iformation in connection with your deep interest in call girls. As always I've brought new team of teenager call girls ready to satiate your hunger of female companionship. Just click the links for guidance. وبأيدي العديد من افضل وامهر الفنيين والعمال المتخصصين في نقل الأثاث والأثاث وجميعهم تم تدريبهم وتأهيلهم عن طريق المؤسسة للقيام بنقل جميع أشكال العفش مهما كانت صعوبة نقلها.